In this already politically-supercharged general election year, and in the wake of the Charlie Hebdo murders, the need for art to examine our freedom of expression feels more urgent than ever. 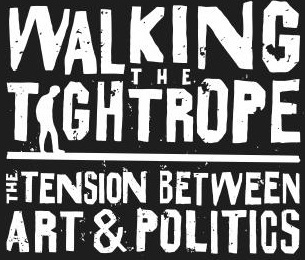 Walking The Tightrope is a mini-festival of political playlets from big-hitting writers, which pull apart what we’re seeing (and not seeing) in the media today. Twelve famous playwrights, including Caryl Churchill, Neil LaBute, Julia Pascal, Mark Ravenhill, April De Angelis, Evan Placey and Sarah Solemani, have been commissioned to each produce an “explosive” five minute play that responds to topical issues and tackles the tension between art and politics. The dozen provocative stories will run consecutively each night next week at Farringdon’s Theatre Delicatessen. And after each show there’ll be a half hour discussion led by a changing roster of thinkers and arts specialists. Expect it to get heated. The event has been produced by Offstage Theatre with Theatre Uncut and Free Word. Selected plays will also be available on the Theatre Uncut website for anyone anywhere to read and perform, rights-free between 2-9 February 2015. Walking The Tightrope is on at Theatre Delicatessen at 119 Farringdon Road from 26-31 January 2015 starting at 7.30pm (with a matinee on the Saturday starting at 2pm). Tickets cost £12-£15.